Hi everyone! We’re counting down the witching hours to the spookiest day of the year with two weeks of sales on bone-chilling games and movies. Aliens, demons, vampires, zombies – we’ve got you covered from now through Dia de Los Muertos. Save up to 65 percent on our Week 1 Sale of the Dead titles. PlayStation Plus members save up to 75 percent. Head over to PlayStation Store this week to snag games like Alien Isolation, Grim Fandango Remastered, and Dead Island Riptide – Complete Edition, as well as films like the Insidious Trilogy and more. Check out the full lineup, but don’t scare too easy – Week 1 of our Sale of the Dead ends Monday, October 26th. 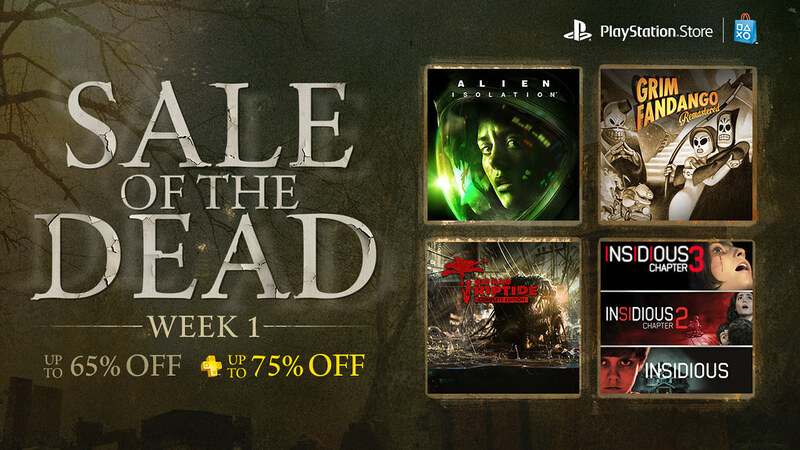 Check back next Tuesday, October 27th for Week 2 of PS Store’s Sale of the Dead and a brand new game lineup. *Update: This article previously listed movie titles that were not part of our Sale of the Dead Week 1 offerings. These titles have been removed. Thank you for your understanding. Is Organ Trail: CE compatible with the Playstation TV? I’d like to know. Thanks! Really want to see The Walking Dead Season 1 & 2 (PS4) on sale!! These were on sale last year (I think around the holidays). I picked them both up for $12! Hopefully they go on sale again, so that many others can enjoy the series! This time i won’t miss the chance to grab Dead Rising 2 Off The Record, thank you SCEA. Is Castlevania: Lords of Shadow – Mirror of Fate HD a combo back with Lords of Shadow 1 + Mirror of Fate or just “Mirror of Fate” standalone? Is the first Lords of Shadow game on sale? Mirror of Fate HD is standalone, The first Lords of Shadow game never got a digital release, only 2 and MoF HD. Hope that helps! This sale freaking owns. I just bought Castlevania: DCX Chronicles and MoF HD, Catherine, Siren (PS2 original, already have Blood Curse), DR2: OtR, GrimGrimoire and Darkstalkers. Most of the other games on sale I already have them, lol. Chieh! like I posted on the Store Update post, can you check what’s the deal with Zombie Apocalypse for the PS3 showing up in the “All Deals” section as $9.99? that’s the regular pricel. It’s not discounted and wanted to buy that one for some co-op goodness. Thanks! Please, please PLEASE give us a discount for Dead Space: Extraction on week 2! Again, great sale. Thank you and know that you guys rock! So I’ve maybe only commented on here 3 times in the last 3 or so years but I must say the prices of these sales are super weak. I remember picking up Dead Rising 2 OTR up for less than $5.00 last year. Fatal Frame 1 and 2 were about $2.50 each. I’m just amazed that SCEA has decided that the pricing strategy of their sales needs to be less gamer friendly. Well I for one will scale back my purchasing power and focus on my backlog. Thanks for the sale memories SCEA. It was a good ride. PS. It would be great if you surprised me next week, but I doubt it. Sony doesn’t need to make good deals anymore. People don’t realize in the USA 360 owned like 70% of the market! (only worldwide did Sony tie Xbox). Now in the USA its the other way around the ps4 and Xbone. So Sony doesn’t need to sweeten the pot as much as they used to. I’d rather see one big sale over the weekly sales. Weekly sales mean you need to decide if you are going to get something now without knowing what’s coming next week. Alien Isolation is $19.99 at retail. Paying $10 more for digital is a rip-off. I know that Until Dawn is still new, but I would love for this to be on sale in time for Halloween! Oh, and Mass Effect 3 on Playstation Now would be an absolute dream for the holidays! Not interested in any of these… guess I’ll have to wait for Black Friday deals! Please have an amazing sale then!!! Watching for DMC for a while, I guess it’s time for me to get it. What a sweet price for Castlevania: The Dracula X Chronicles! It’s the sale I’ve been waiting for… unfortunately, I’m still waiting for PSTV support. It’s running in Europe… why doesn’t Konami want American money? Yeah, that Gradius Collection needs PSTV support too. Same with Sega Genesis Collection. There really should be NO reason for that PSTV whitelist to extend to PSP games! I’ve been waiting for Grim Fandango to go on sale, even if it is only a few bucks off. Was tempted to grab Alien Isolation, but I saw it at EB Games for cheaper just a few hours ago. So definitely Gim Fandango this week. Looking forward to seeing what appears next week. HORRIBLE HORRIBLE HORRIBLE Halloween Sale, people! Just…awful. …and PS3 & Vita getting the shaft…as usual. PS : On the plus side though…you’ve managed to do such a crappy job with Week 1 that it may not be that difficult to “upgrade” the Halloween Sale for week 2 …right? you can pick up dead space for pennies nowadays. And Dead Space 3 was free last year I believe. But yeah, maybe of these prices are HIGHER than retail and/or used copies. Alien. Come on. DmC. really? Extra points for having Berserk on sale. If you haven’t picked up Grim Fandango already, and are a fan of point & click games, adventure games, Tim Schafer games or just quirky, funny games in general, go get it NOW! What a horrible sale!!! Seriously no telltales walking dead seasons 1 or 2? No zombie army trilogy? These games should’ve easily been on sale now!!! Hope to see Ultimate Ghosts “N Goblins next week. Hopefully we can get another sale on Arkham Knight, given that it’s Halloween season. The fact that we had a WB sale last week and the AK sale from the previous week wasn’t extended alongside the other discounted WB games is irritatingly puzzling, to say the least. The Resident Evil remake for PS4 HAS to be in Week 2. Alien, Outcast, Grim Fandango are definitely worth it. Alien was one of the few games that I pre-ordered in the last few years. I want to get Organ Trail but the controls on EVERY version I ever tried before… PC, Tablet, etc are downright horrible. I wonder if they ever fixed that issue. Almost everything ps plus related has been God Awful this past year….The sales for ps4 games is a travesty considering all the sales for physical retail copies of ps4 games…which coincidentally i’ll never undersatand why digital copies arent cheaper…PERIOD…when it takes zero money to MANUFACTURE or DISTRIBUTE….The truth of the matter is I prefer digital over retail and I wOULD LIKE SONY’S DIGITAL SALES TO REFLECT real-world retail sales. ALSO…can we please get a sale on UNTILL DAWN!!! AGREED! Since the invention of Steam, GoG, and any other Digital distribution systems… games should be LESS when you do not get a book, case, media version. I also think the same for eBooks and digital music. I also prefer digital and rarely buy a physical copy of ANYTHING anymore, unless it is the ONLY option. On my PS4 I only own Alien in physical form, but I am a sucker for anything dealing with the Alien Universe. All my other games are from the PS+ store. I just wish we get more games at better prices at some point. I feel like I should have kept my PS3. LOL. Fortunately I stopped buying games on sale. There’s not really enough incentive to purchase anything anymore. Before it was like $1 or $4 for a game and it’s like “woah I need that”. Now it’s just, idk. I don’t mind, but I don’t think Sony is generating a lot of revenue by pricing games higher than they were previously. I really wanted Mirror of Fate,been waiting a while to buy it but $6 is still too high of a price.Doesn’t even look like its on sale and this is the Plus price.Think I’ll get me some Whistleblower and just wait for the next week. Where is Bioshock and Bioshock 2? I thought I saw these games in the list earlier. My mistake? That was last weeks sale, $3 each if I recall. SONY, would you please explain why Amazon offers the physical retail copy of BLOODBORNE right now for $29.99 and yet to purchase the PlayStation 4 [Digital Code] from them, AMAZON, but in other words..YOU…being SONY…its $39.99????? This is the kinda stuff that makes me, nuts. can WE the consumer, at least get some parity. And again, I still cant fathom why digital download should ever be more expensive than a physical retail copy of a game, when in my mind, it should be the other way around. I bought on “Grim Fandango”, “Dead Nation”, “KILLALLZOMBIES” & How to Survive” on PS4. I still wonder when i’ll see a good game for ps4 on sale, far cry4, black flag, witcher 3… alien for 36.00? An 1 year bad sale game? The real Halloween centerpiece next week should be Bloodbourne at $30. I would VERY buy that. Is there a reason why I get an error every time I try to add The Simpsons Tree House of Terror Collection 1 to my cart? It says its part of the TV Sale of the Dead. Am I the only one that it is still looking at Week 1 deals and it is already October 27th?